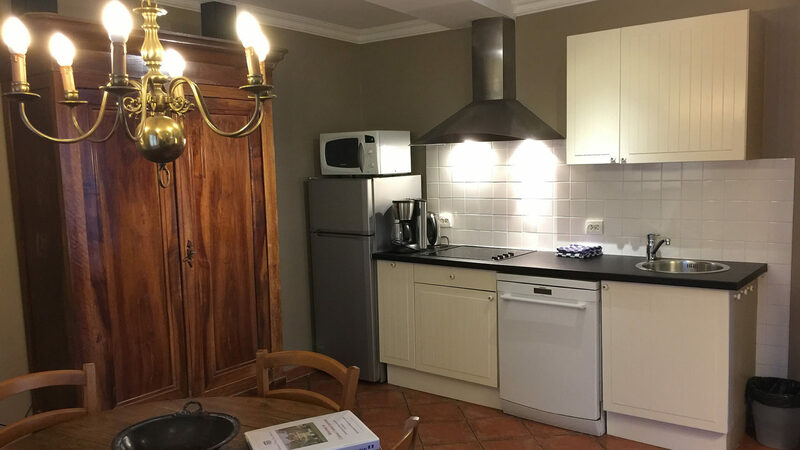 Cottage "Sauternes" (2-4 pers) Kitchen with dishwasher etc. 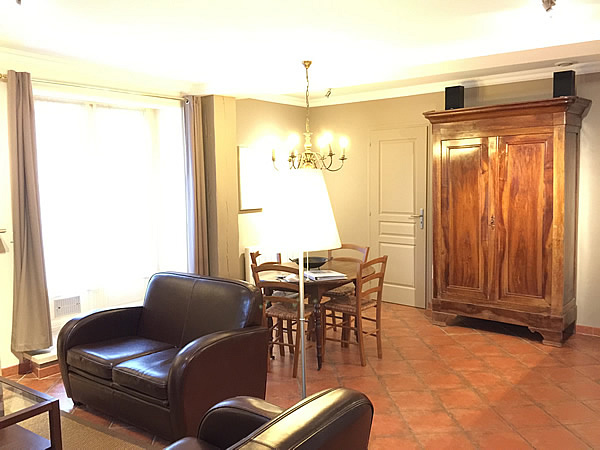 "A most relaxing week in the gite Sauternes. We really appreciated the attention to detail your superb recommendations for places to visit." "What a wonderful time we had here. Your recommendations for places to visit and dine were most appreciated." 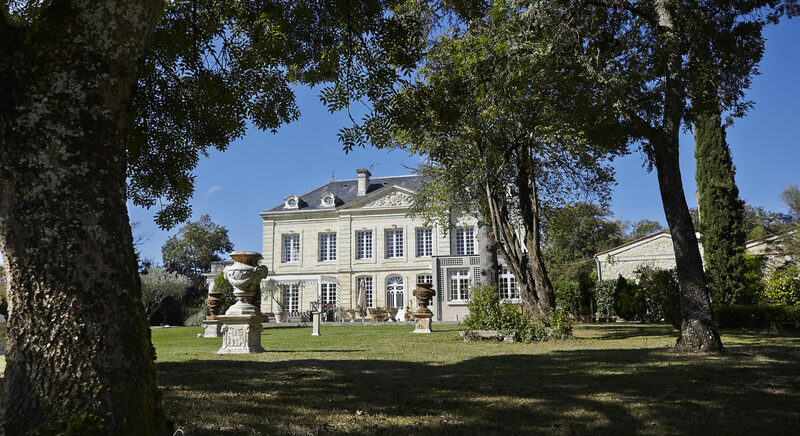 "We would not hesitate to recommend Chateau Coulon Laurensac to our friends." Loved our stay here: we will spread the word! "Satisfied the needs of food and wine loving parents and two children. Superb restaurant recommendations, a cute family dog and lots of space." "It has been a lovely relaxing week for us both while also seeing Bordeaux and all its surroundings." Sauternes (2 or 4 persons, 50m2 or 87m2) [646 square feet or 936 square feet]. 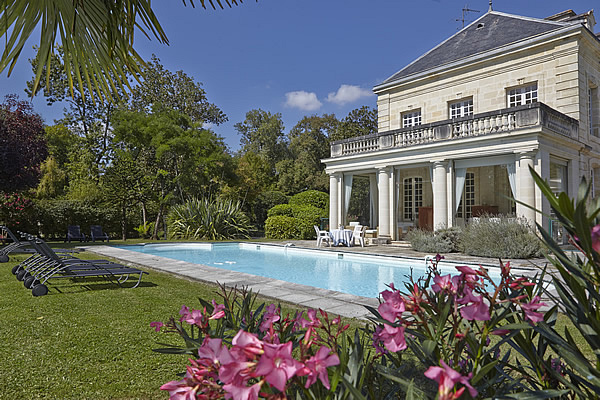 This charming holiday home is situated next to the château in the former barrel hall. 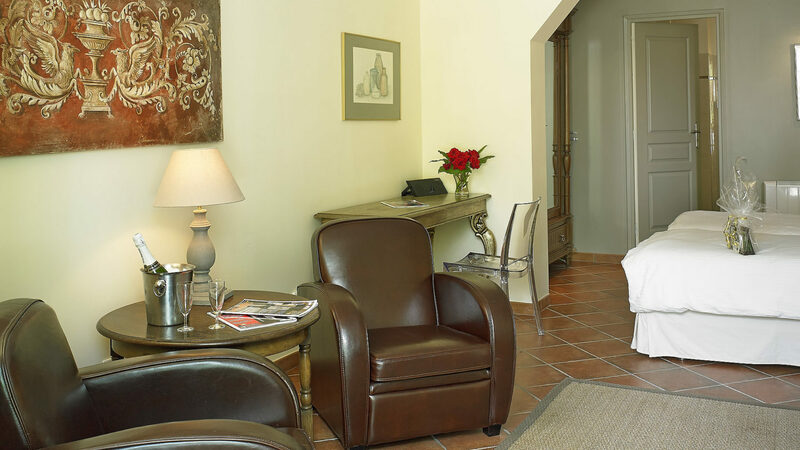 This beautiful 300 year old building has been completely renovated in order to welcome you. We didn’t name this delightful holiday home after a famous wine region by accident. It’s in here that in days gone by, the wine production of Château Coulon Laurensac used to age. 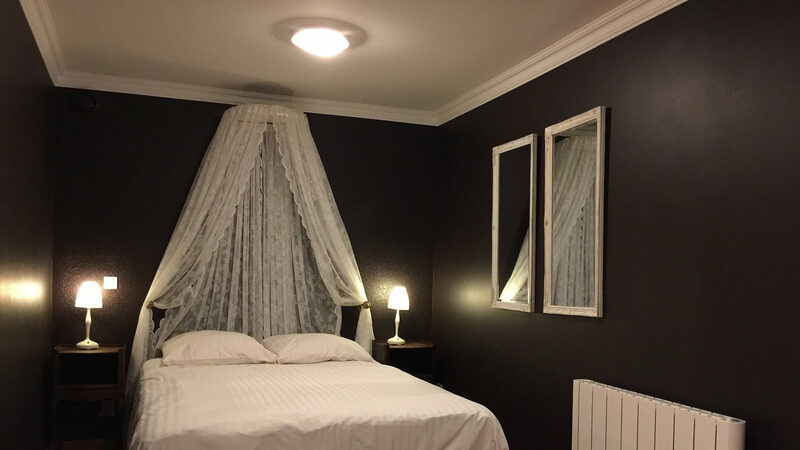 Now it is a beautiful gîte to welcome you for a relaxing stay in the Bordeaux region. Of course there is ample parking space on the property. for 2 guests or for 4 guests. In the two person option you dispose of a separate and spacious air-conditioned bedroom on the same floor. Here you find a double bed (1.40m by 2.10m) [4.6 feet by 6.9 feet] and an extra (large) single one. When you arrive at the Château, the bed is already made. The beds are provided with duvets. 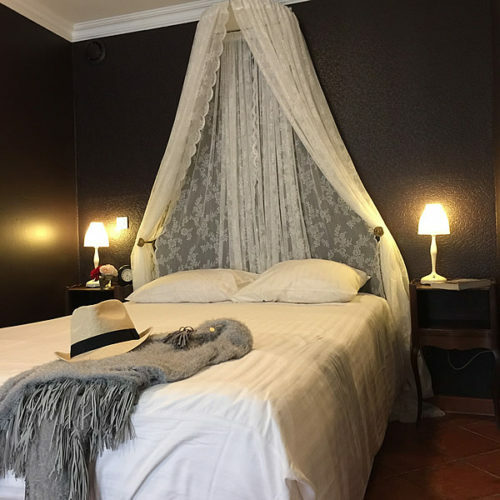 Bed linen and towels are included (one set per week). Please bring your own beach or pool towels. 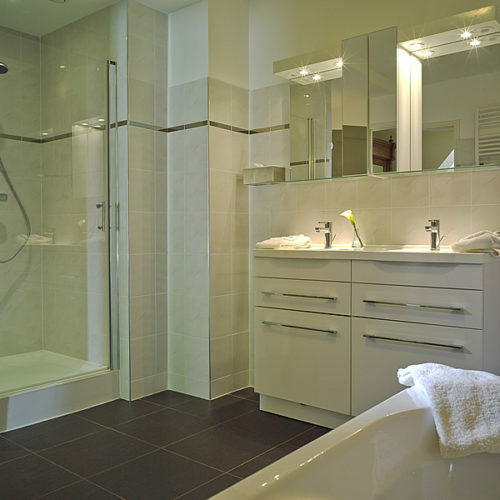 The bathroom has a jacuzzi bath, double washbasins and a WC (see picture above). In the four person option you dispose of a second large air-conditioned (twin bedded) bedroom on the same floor (see picture), (two beds of 0.90m by 2.00m) [2.9 feet by 6.6 feet]. When you arrive at the Château, the beds are already made. The beds are provided with duvets. 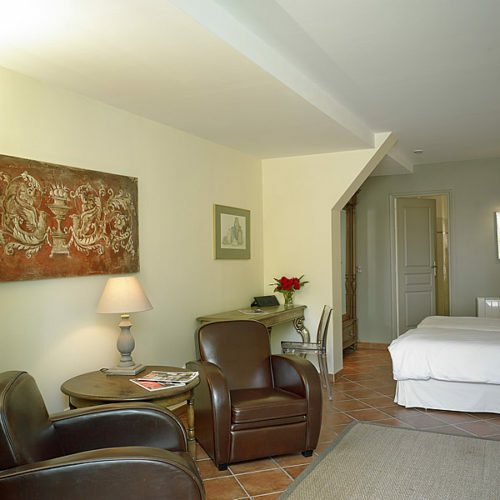 Bed linen and towels are included (one set per week). Please bring your own beach or pool towels. 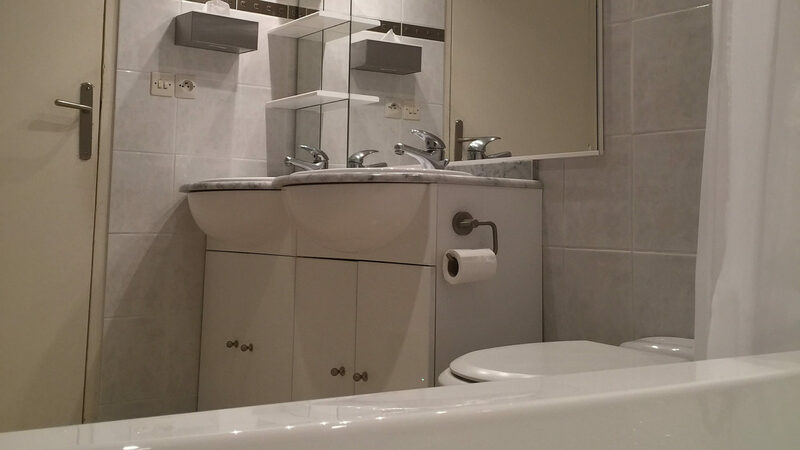 This seconds bedroom comes with its own spacious enjoyable bathroom. 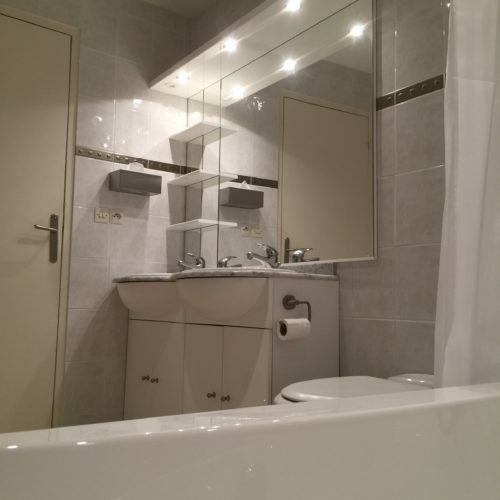 This second bathroom is equipped with a separate shower, a jacuzzi bath, double washbasins and a WC. The size of this second bedroom is about 37m2 [398 square feet]. 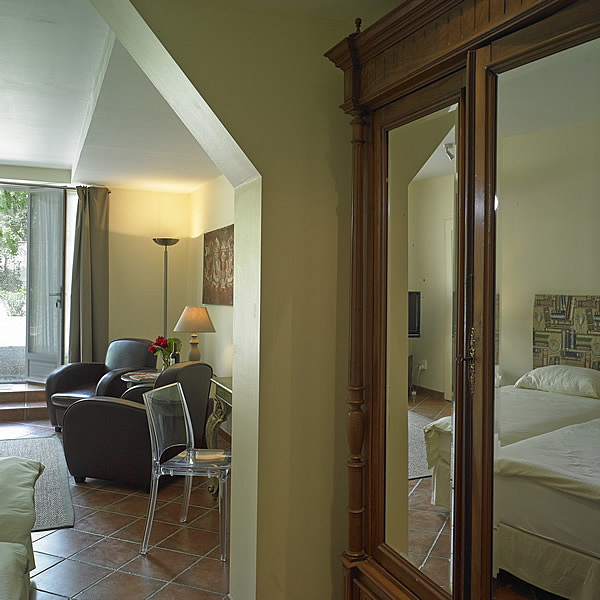 This separate room has comfortable seating grouped around it’s own TV (flatscreen, 32 inch) and DVD player. An audioset with radio complete the technical equipment of this second bedroom. 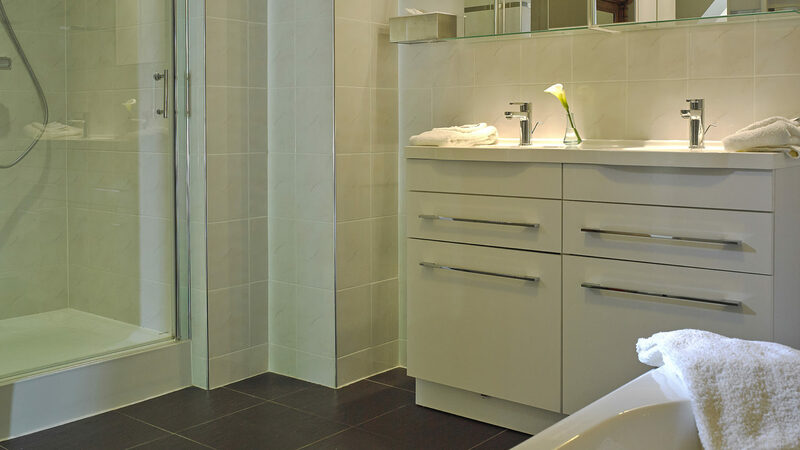 This comfortable holiday home has all the right ingredients for a lovely stay and is finished to a high standard. The spacious ground floor cottage is tastefully decorated and furnished and has lots of home from home comforts. There are comfortable leather sofas grouped around the former fireplace, and a fully fitted and equipped kitchen. The kitchen/dining room is modern and well-equipped (table, four chairs). There is a cooker, fridge/freezer, dishwasher, etc. 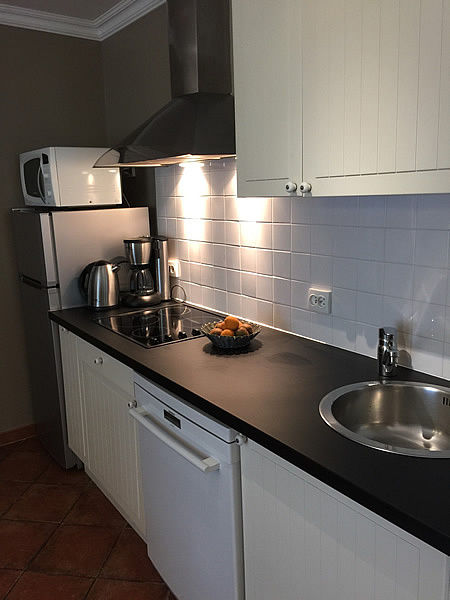 As well as bowls and pans, there is a coffee machine, kettle, toaster, iron and vacuum cleaner, in short, everything you need for a comfortable stay. 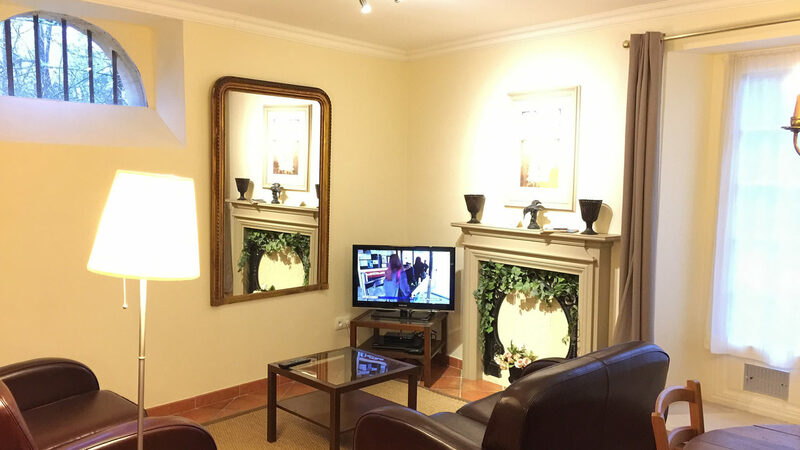 Complementary wifi Internet access and a TV (flatscreen, 32 inch) with DVD player are all at your disposal to make for a comfortable stay. In addition to the French television there is a wide selection of satellite channels. Among them many British and American channels like BBC, Sky news, CNN, etc. A stereo set with CD player and radio complete the technical equipment of your accommodation. 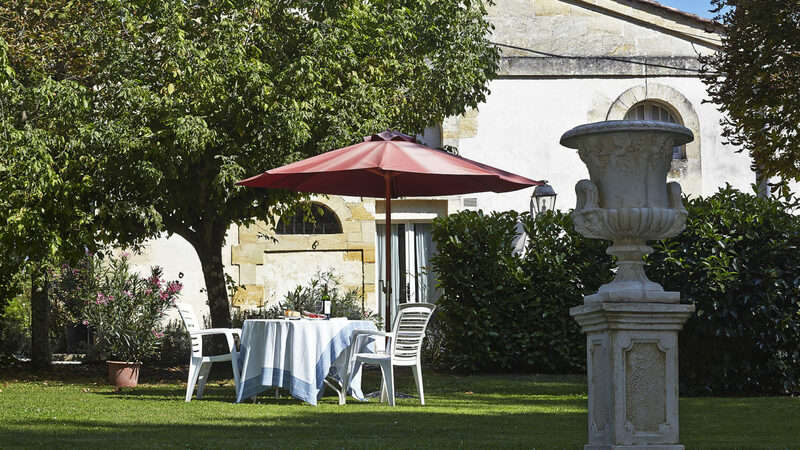 Sauternes overlooks the park and has its own garden (almost half the size of a football field) and boasts a lovely seating area with garden furniture and a sunshade. The gite is non-smoking, and sorry, no pets are allowed. You can enjoy moments of leisure or take a dip in our large heated swimming pool (6 by 12m) [807 square feet]. 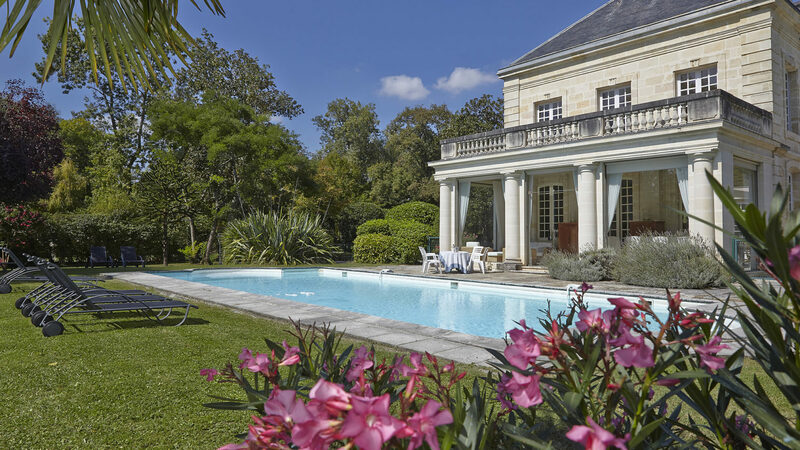 The pool, which has roman steps, is stunningly set at the south side of the château. The pool is heated from early May until the end of October, depending on weather conditions.